"Beginning August 1 through August 31, parents can receive an all-new Pocoyo DVD – Dance Pocoyo Dance!–with the purchase of 10 Langers Juices (plus $1.99 shipping and handling), while supplies last. -Parents know that sodas, sports drinks, sweetened juice or fruit-juice cocktails have too much sugar, too many calories or too many additives. That’s why Langers 100% fruit juice is the smart choice for parents and their kids. -Mayo Clinic Nutritionist Katherine Zeratsky, R.D., L.D., says that while whole fruit is the best choice, certain types of fruit juice can be a healthy part of your child's diet. -Recent studies have confirmed that drinking moderate amounts of 100 percent fruit juice doesn't affect a child's weight. What 100% fruit juice does offer is more vitamins and nutrients and fewer additives than other drink choices. And as the temperatures soar, Moms and their kids can use Langers Juice to create their own healthy and refreshing fruit juice popsicles! Simply pour 4 oz of juice into a paper cup and pop it into the freezer. When the juice freezes, kids can eat the frozen treat with a spoon, or simply lick the cold concoction, peeling back the paper cup as needed." What we thought: If your kids, like mine, are Pocoyo crazy they will love this DVD! This compilation of fun Pocoyo episodes has provided hours of entertainment for my little ones. My favorite thing about Pocoyo is how each episodes teaches important lessons like team work, problem solving, and being kind to others. 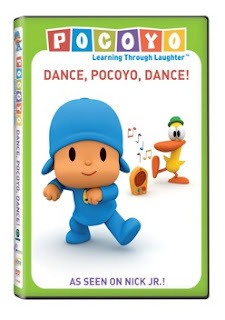 Pocoyo is fantastic educational entertainment and this DVD really got the kiddos up and moving and having a blast:) ABCD Diaries gives Dance, Pocoyo, Dance an A+!